SUADİYE, 1998-2001 YILLARI ARASINDA TARLACIK SOK. SAİM UZUNAL APT. 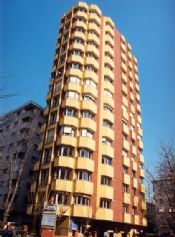 NO:2 ADRESİNDE GERÇEKLEŞTİRİLMİŞTİR. BU PROJEMİZ TOPRAK MÜLKİYETİ SATIN ALINARAK YAPILMIŞTIR. 200 m2 OLAN 13 ADET DAİRE OLMAK ÜZERE TOPLAMDA 13 BAĞIMSIZ BÖLÜM OLARAK TAMAMLANMIŞ VE İSKANI ALINARAK ALICILARINA TESLİM EDİLMİŞTİR.